According to the American Association of Dermatology (AAD), acne is the most common skin condition in the United States, affecting up to 50 million Americans annually with a nontrivial percentage suffering from a chronic form of the condition. 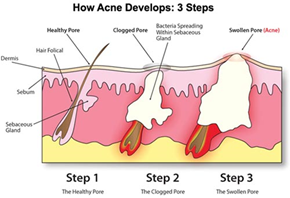 Fortunately, for people suffering from persistent acne, Paul M. Friedman, MD et al. showed in 2004 that near-infrared laser light could be used to damage the sebaceous glands causing them to shrink or in some cases be destroyed without damaging the skin. This particular gland is the one responsible for producing the oil which is metabolized by the bacteria during the inflammation process. While this procedure is not painless, the only side effects shown were temporary redness and swelling, which lead to the FDA approving the first commercially available acne treatment laser, the Smoothbeam by Candela a 1450 nm wavelength diode laser. Since then many other lasers in the 1400nm – 1500nm range have been approved by the FDA for the treatment of acne. In this blog post, we are going to take a look at the clinical requirements for laser acne treatment and how the current state of the art high power laser diode technology are utilized for treatment. While there have been studies performed showing some efficacy when utilizing blue laser and LED light to specify target and kill the p. acnes bacteria, it only provides upto 40% decrease in acne lesions. The procedure requires continual treatment (up to 14 hours per month) because bacteria’s food source (the oil) is left unaffected, and it has been shown that patients with cystic acne experience a worsening of symptoms when exposed to blue light. Utilizing near-infrared light instead focuses on the photothermal heating of the mid-dermal layer of the skin where the sebaceous glands are located, effectively burning them out. The localized heating is due to the light’s depth penetration, as shown in the figure below from Stewart Wilson’s article titled “Semiconductor diode laser advances enable medical applications,” published in BioOptics World magazine. From that figure, it is clear that wavelengths between 1400 nm and 1500 nm are ideal for targeted absorption in the middle of the dermis, without damaging either the skin’s surface or the subcutaneous fat. In their initial work the group led by Dr. Friedman at the University of Texas Houston School of Medicine, and MD Anderson Cancer Center utilized non-over lapping 6mm diameter 1450 nm laser pulses with fluences between 10 J/cm2 and 14 J/cm2 for the treatment. This treatment performed once every 4 to 6 weeks, show an average decrease in acne lesions counts of 37% after one treatment, 58% after two procedures, and 83% after a third. These results are promising for dramatically decreasing the number of visible lesions patients suffer with, in many cases changing their lives by increasing their self-confidence. For a typical laser pulse duration of 200ms, these fluences require approximately 20W of laser power at the application site. At the time, these power levels were relatively hard to produce, but with recent technological advances in laser diode packaging made at Akela Laser based in Jamesburg, NJ fiber coupled 1470nm high power laser diode modules are now available with output powers of up to 25W. By combining the emission of multiple individual laser diodes in a common beam or optical fiber, Akela has achieved performance superior to that of traditional laser bars. Additionally, each laser diode in the module operates independently and is not affected by the thermal crosstalk from the neighboring emitters, making their line of fiber coupled diode laser modules one of the most comprehensive in the industry. 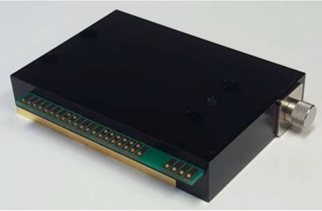 Here at RPMC Lasers, we are proud to offer the KE70HWBFN-30.00W, a 1470nm laser diode module with 30W of output power from BWT, and the ALC-1470-25000-FM400.22-R, a 1470nm laser diode module from Akela providing 25W of power out of a 400 micron, 0.22NA fiber port. The ALC-1470-25000-FM400.22-R laser module is also available with a built-in laser power monitor, visible aiming beam, and fiber sensor all of which are critical for medical certification. This compact module is only 80 mm long by 55 mm wide and designed with a solid metal base for easy integration with a standard high-power TEC up to 55 mm in width. Operating at 8.2V and a drive current of 12.5A, this laser module provides nearly 25% wall plug efficiency making it ideal for integration into modern energy efficient medical instrumentation. For detailed technical specifications on the full range of high-power fiber-coupled diode laser modules from Akela Laser click here or talk to one of our laser experts today by calling 1-636-272-7227 or click here.